Fuelling: Carbohydrate (CHO) is the main energy source during high intensity exercise. Consuming a carbohydrate-containing solution improves exercise endurance and performance. The source of carbohydrate in CHO CHARGE® is an advanced Vitargo®/fructose combination. Vitargo® is a unique energy boosting high molecular weight carbohydrate that is rapidly digested into glucose; glucose and fructose combined provide an enhanced delivery of fluid and fuel to working muscles. Vitargo® has a low osmolality, meaning that it is transported rapidly from the stomach to the muscles for fuel. Dehydration of just 2 % of bodyweight reduces performance and increases the risk of injury. CHO CHARGE® contains electrolytes for rapid hydration and CHARGES your workout with optimum amounts of a combination of fast-releasing carbohydrate. Why choose CHO CHARGE® Decaffeinated? CHO CHARGE® is a scientifically-formulated energy drink designed to fuel and hydrate your body before and during exercise. Whatever your sport or activity, CHO CHARGE® can help you to perform for longer at high intensity. By using CHO CHARGE® you will be fuelled, hydrated and ready to perform at your best in any demanding situation. Each serving (35 g in 500 ml water) of CHO CHARGE® provides a 6 % CHO solution, which is optimal for hydration and fuelling the body during exercise. Follow CHO CHARGE® intake guidelines for appropriate hydration and the achievement of maximum performance potential. Osmolarity is defined as a measure of solute concentration in solution. Osmolarity is an important consideration when designing a hydration and fuel mix formulation to aid in sports performance especially before, during and immediately after high intensity exercise. When mixed with 500 ml of water each 35 g serving produces a hypotonic solution (Osmolarity <278 mmol/L) allowing for optimum fluid and fuel absorption. Decaffeinated: CHO CHARGE® Decaffeinated is designed for athletes who wish to avoid caffeine products. Because it does not contain caffeine, it can also be taken after training using appropriate recovery guidelines. Branched chain amino acids: CHO CHARGE® is enriched with branched chain amino acids (BCAAs) which are protein building blocks. BCAAS may speed up the recovery process by providing building blocks to repair damaged muscle fibres post-training. BCAAs have an important role in central fatigue during exercise. BCAA intake in suitable amounts during exercise can reduce the feeling of fatigue and may improve exercise performance. 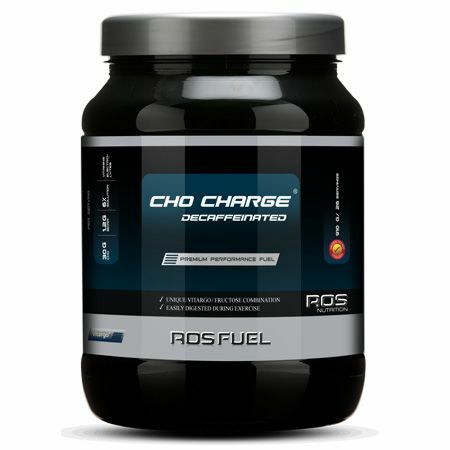 CHO CHARGE® Decaffeinated is a registered trademark of ROS Nutrition Group Limited. Ingredients: Barley starch amylopectin (Vitargo®), fructose, L-leucine, trisodium citrate, sodium chloride, magnesium gluconate, potassium chloride, L-isoleucine, L-valine, zinc citrate, ascorbic acid, nicotinamide, dl-alphatocopherol acetate (50 %), tricalcium phosphate, D-calcium pantothenate, pyridoxine HCL, thiamine hydrochloride, cyanocobalamin. Lemon Flavour: Citric acid (acidity regulator), lemon flavour, sucralose (sweetener). Costill DL and Saltin B. Factors limiting gastric emptying during rest and exercise. J Appl Physiol 37: 679-683, 1974. Coyle EF and Coggan AR. Effectiveness of carbohydrate feeding in delaying fatigue during prolonged exercise. Sports Med 1: 446-458, 1984. Davis JM, Burgess WA, Slentz CA and Bartoli WP. Fluid availability of sports drinks differing in carbohydrate type and concentration. Am J Clin Nutr 51: 1054-1057, 1990. First pour 500 ml of water into a shaker, then add 35 g (1 scoop) of CHO CHARGE® to produce a 6 % CHO solution. Shake well and drink as your pre-workout/during workout drink. For easy mixing, use the ROS Nutrition shaker. CHO CHARGE® provides an optimal hypotonic (Osmolarity <278 mmol/L) solution in doses of up to 50 g per 500 ml, the ideal 6% carbohydrate concentration for hydration can be achieved at 35 g per 500 ml. Hypotonic solutions are the most appropriate choice for optimum absorption of fluids and hydration directly before and during exercise.